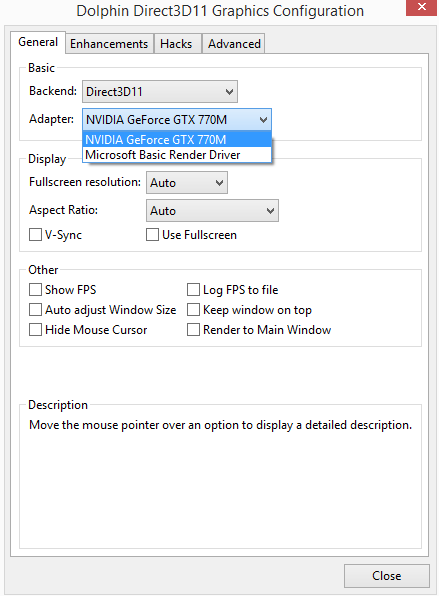 When trying to select a video card, I only get the option for my dedicated nvidia card (specifically a gtx 770m). Picture. I read that it is bad to select the dedicated card and even though I get 60FPS, it still lags every once in a while. I am running on an Alienware 17 laptop and it does have switchable graphics. The internal card doesn't show up in device manager unless I specifically tell my laptop to run off of that card. So my question is, is it really all that bad to select the nvidia card even though no other options appear? Your profile says you are still using Dolphin 4.0, is that correct? If so, you should really update to the latest dev revision. Also, if you have an Nvidia card, there's really no reason for you to be using D3D, you should go with OGL. That alone may fix your lag issues. You're running an old version. Grab the latest dev build and switch over to OpenGL. (03-07-2015, 11:02 AM)Kurausukun Wrote: Your profile says you are still using Dolphin 4.0, is that correct? If so, you should really update to the latest dev revision. Also, if you have an Nvidia card, there's really no reason for you to be using D3D, you should go with OGL. That alone may fix your lag issues. (03-07-2015, 12:08 PM)KHg8m3r Wrote: You're running an old version. Grab the latest dev build and switch over to OpenGL.